In the war between MMO developers and shady players looking to exploit the system, the innocent often get caught in the crossfire. Such was the case yesterday, when somewhere under 150 honest, hard-playing Star Wars: The Old Republic players had their accounts banned from play. BioWare is sorry, you guys. 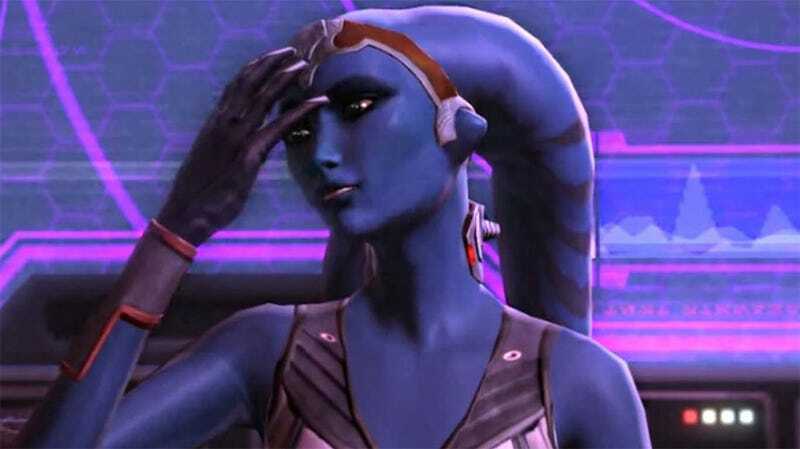 We are contacting you to notify you that we have found your Star Wars: The Old Republic account, (Redacted) , to be in violation of our Terms of Service. Due to the severity of the violation, we are suspending your account for 1 week (168 hours) effective immediately. According to another player, the problem arose from a new feature introduced in game update 2.1: Customization, called "Getting Yourself Suspended." No wait, it's called "Collections", which gives players the ability to dupe certain items to share with other characters on their account via the game's Legacy system. Also introduced in update 2.1 was an exploit that allowed unsavory types to game the feature other players were using legitimately, so when the Terms of Service team mobilized, they had a little trouble telling the good guys from the bad guys. According to a post on the game forums this afternoon from community manager Eric Musco, less than 150 accounts were unfairly banned or suspended, victims of this sensible war. What occurred, and what you folks reported, is that there was a small subset of players who were incorrectly caught in this tracking and subsequently actioned. Just to give you a bit of perspective, there were less than 150 people in total who were incorrectly actioned as a part of what happened yesterday. If you were one of those players who had not been exploiting and were wrongly flagged, you should have already been contacted by CS as of reading this message. If this is what occurred to you I cannot express how sorry we are. We are going through great lengths internally to avoid situations like this happening in the future. If you have not had your suspension reversed and you feel this was in error, please contact accountdisputes@swtor.com and they will be able to look into the issue further. We apologize for any inconvenience this has caused, again if you were affected you should have already been contacted and if not please email the address listed above. An unfortunate situation, but when you're dealing with something as fragile as an MMO economy, it's better to be safe than sorry. Everyone that shouldn't have been affected should be restored by now, and if your account hasn't been, either they missed you or you don't realize how much of a horrible cheater you really are.